Meet the world's first ball-point pen made almost completely from wood without plastic parts; the material used already by our ancestors. Add your personal touch by adding a full-color print of logo, text, sign, name, motto, message etc., for no extra charge on the standard price. It features a unique wooden mechanism to activate/deactivate nib of an insert and assures required life cycle/durability. The Wooden clip is elastic and strong enough. 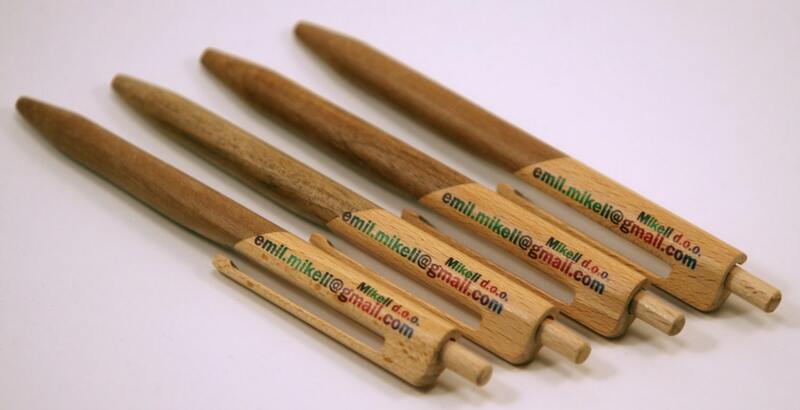 Some parts of this pencil are made from recycled wooden material and give environmental benefit. It comes gift wrapped and ready for giving. 2. In free text field entitled "Add your personalization", write the text and indicate the color of your personalized print. 3. If you order a set, you can put a different name (logo) on each pen. 4. Before dispatch, you will receive a preview to confirm the print design. * Please be aware of a maximum number of characters, which includes also spaces and other symbols. Your text is to be optimally printed according to surface and space available. Please see also pen’s photo with indicated dimensions (diameter and length) in millimeters and inches. ** By default, we position the printing to look the best on the pen, but if you have a particular request, please send us an e-mail. For a discount on larger quantities please contact us. When you buy something from a Woodworker you’re buying more than an object. You’re buying hundreds of hours of errors and experimentation. Sincerely thanks for taking your time and checking our promotion material. In case you have any question or special request, please do not hesitate to contact us. We are going to reply to you in the shortest possible time. Beautiful pens, very unique. Great quality! Very pleased!!! Fast shipping!! Thanks for the pens! Beautiful! Great craftsmanship! Such a unique item in so many ways. Wooden pens (especially those that are handmade) are quite difficult to come by. And these are of excellent quality.